In this lesson you will see a video file being uploaded into the media library by using the Insert Tab and selecting Video. In this lesson you will see how to embed a YouTube Video within a page. In this lesson you will see how to use the media browser to add a description and tags to an image. Once you've discovered how easy it is to push the record button on your mobile device, then it's time to do a little editing. Don't worry about using your laptop. There are some very good video editing apps right on your mobile device. 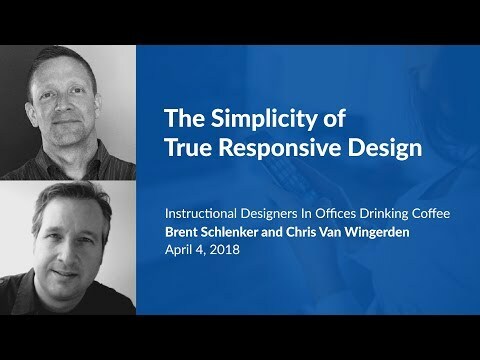 In this episode of #IDIOIDC Chris and I discuss some of the options and why it's important for instructional designers/developers to improve their skills in this area. We had a great conversation on IDIODC about responsive design for learning content. Check it out. In this lesson we'll record an audio narration clip in dominKnow and add it as a media element within a page. This lesson will show you how to delete a marker from the video timeline. Some of the most creative instruction has come from creative personalities outside of the L&D industry. Commoncraft.com is a perfect example. Remember RSS in Plain English? Now you can learn from the masters who launched the explainer revolution. Check out their academy... or if you can't commit to that then I would also suggest the book: The Art of Explanation.